Sometimes when I have a good thing going I don’t know why I change it up. I have pizza dough I love (Portland Pie Co) that I get at the grocery store. It comes in regular, beer, and basil but I especially love the garlic. 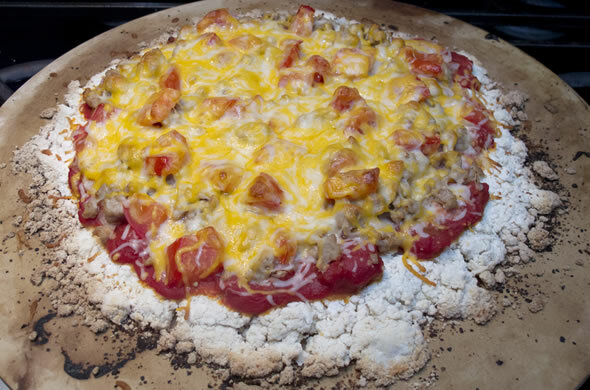 I’m not sure why I haaaad to try making biscuit dough crust. It was terrible. It tasted OK but looked quite sad. It was crumbly and never molded together. 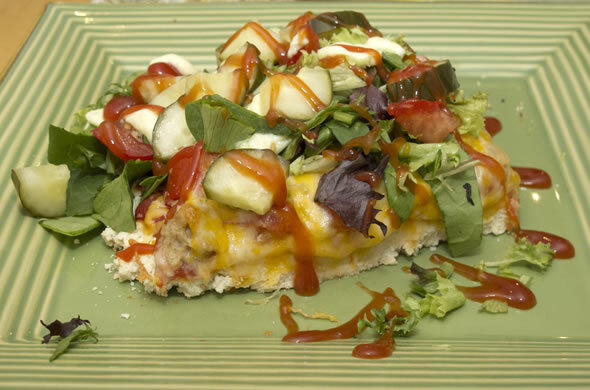 I made Cheeseburger Pizza which was phenomenal despite the crust being not so great. Prepare pizza dough and prebake until crisp at 400 degrees. Cook the ground pork until cooked through and drain. 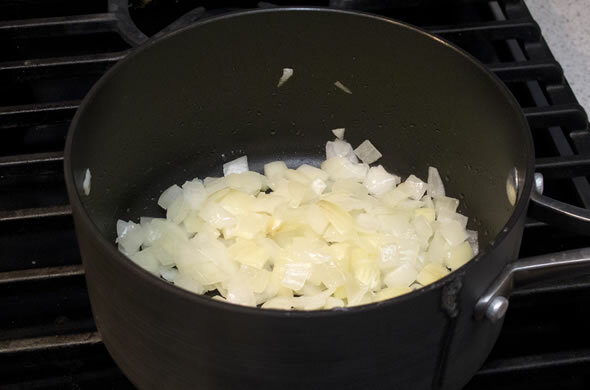 Return to the pan and add onions for a few minutes until softened. Assemble the pizza by topping the dough with sauce, meat, onions, and cheese. Bake 20 minutes or until heated through and the cheese melts. Top with pickles, lettuce, tomato, and drizzle with ketchup and mayo. This was a really good pizza. 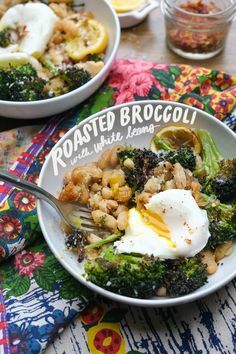 I liked the flavors and it was a great use of some basic ingredients. I had the pork leftover and frozen from another dinner so it was also a great use of frozen meat. Frozen ground meat isn’t great as a burger but as taco meat, or pizza toppings the lack of freshness isn’t apparent. I’ll make it again I’m sure. Pizza is such a regular weeknight dinner because the leftovers are so good too. I ate leftovers even though the “biscuit” crust wasn’t great. Here’s the biscuit recipe if you want to give it a go but I recommend sticking to regular dough. I have another pizza to post soon and I have an idea I haven’t tried yet so stay tuned! In honor of my Momma’s birthday I thought I should be sure to post something she’d think was fun and festive. Happy birthday Momma R! Good thing we’re up on our social media at work because otherwise we wouldn’t have known Roxy’s Grilled Cheese food truck was in the neighborhood at work! It was a few weeks ago during that almost-spring not-really-still-winter and a walk down the street for a freshly made grilled cheese was JUST what was in order. 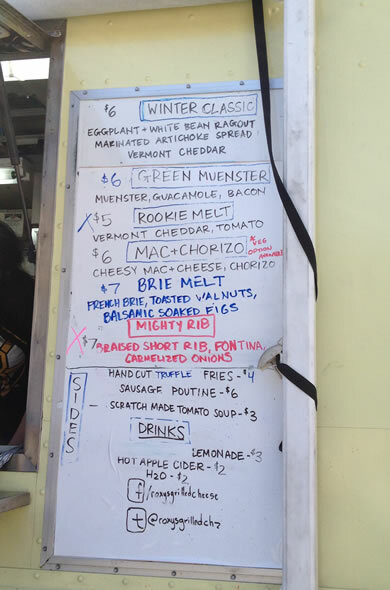 I’ve watched the Great American Food Truck Race and loved the boys of Roxy’s Grilled Cheese from Boston. I really wanted them to win! I get faux-star struck and thought it was fun to see them in action. I got the Mac & Chorizo. 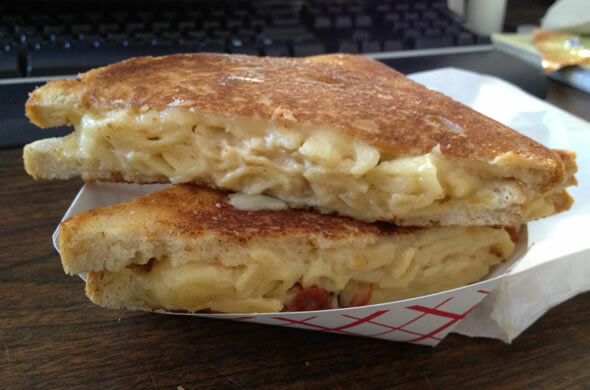 Grilled cheese with mac & cheese and chorizo…how can you go wrong? I was tempted by the truffle fries but abstained. I was glad I did once I saw the size and heft to my sandwich. It was really good, very gooey, and buttery. I think I would have liked more varied textures. The bread really held up to the fillings but it was too soft and gooey. I should have gotten the Rookie Melt with cheddar and tomato. I just couldn’t go to the truck and not get the mac & cheese one. Now, I’ve tried it and can move on. I have a quick post for today. I have a super long weekend and I’m psyched to get ready for our visiting family! If we can see Christmas in July, why can’t we have Thanksgiving more often? 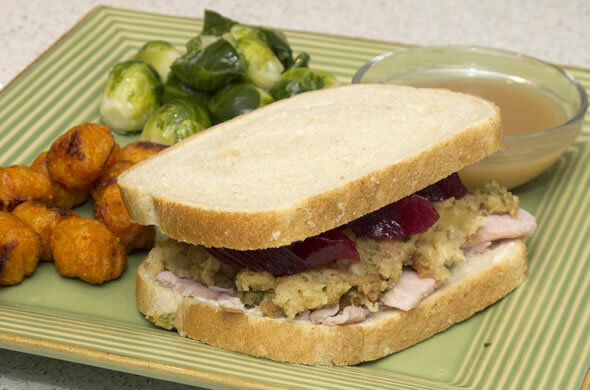 I randomly thought of Thanksgiving sandwiches one night for dinner when it was rainy and gross out. It was a fun one and super fast. 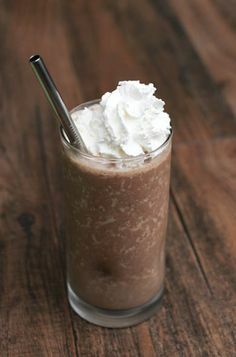 I know nobody needs a recipe but I did want to throw the idea out there. I’ll have to make some more deli-like sandwiches soon. 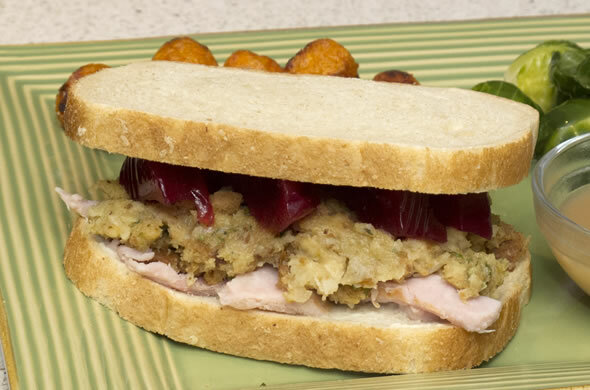 One of my favorite Friends episodes features a Thanksgiving Sandwich with a Moist Maker. Sooo funny. I’ll have to try soaking bread in gravy for the middle sometime too. I made some maple brussels sprouts and sweet potato puffs alongside the sandwiches. It was a really fun and different dinner. Mr. J loved it. We had the rest for lunch the next day. I really like the different textures and temperatures of thanksgiving sandwiches. The warm stuffing and cool cranberry makes this very special. I wanted whole berry cranberry sauce but that’s hard to find in May. The carving board turkey worked perfectly and was closer to real turkey than deli meat I’ve had before. I’ll put almost anything in a calzone. I like to do a few meatless meals sprinkled throughout the regular scheduled items. It is such a cost saving and it is never a bad thing to add more veggies into our lives. This wasn’t my greatest calzone. I think I didn’t like that there wasn’t enough texture for my taste. 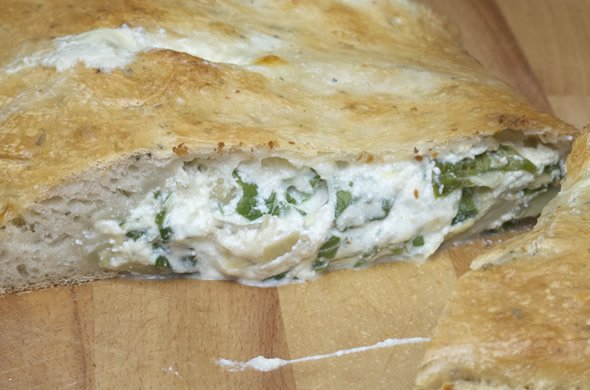 The inside was flavorful but cheese + spinach + artichoke + more cheese, made for a gooey center. 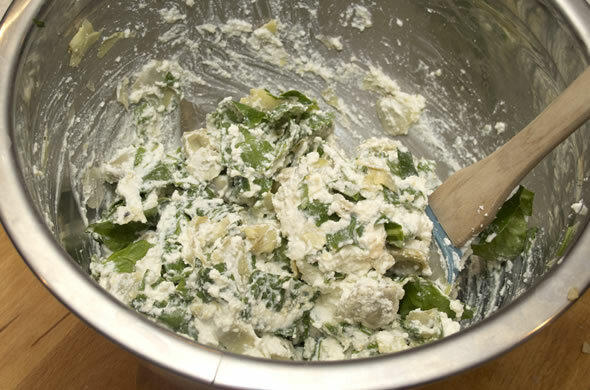 Mix ricotta, spinach, artichokes, and garlic together. 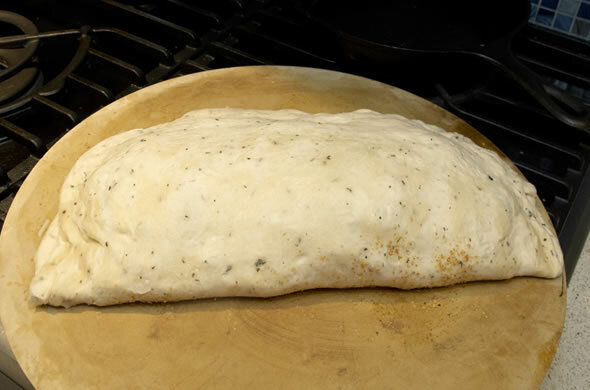 Gently stretch dough into a big circle and lay it onto a baking sheet with one half centered aka, the bottom of the calzone (with the other hanging off, aka the top). Layer some of the filling spreading it out, almost to the edge. 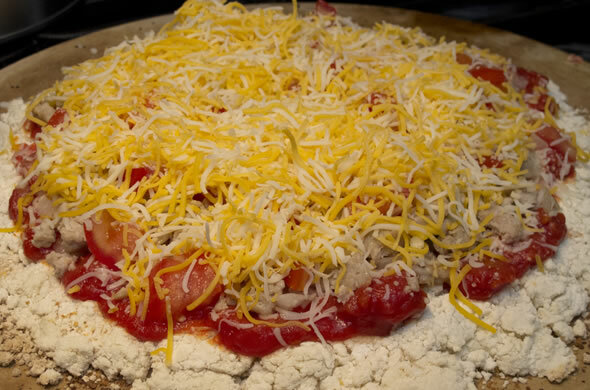 Top it with mozzarella, layer on more filling, then more mozzarella until both cheese and filling runs out. Carefully fold the top over to meet the other edge. Gently press the edges to seal. Brush with eggwash, if desired. Cut about 4 slits on the top to let steam out. 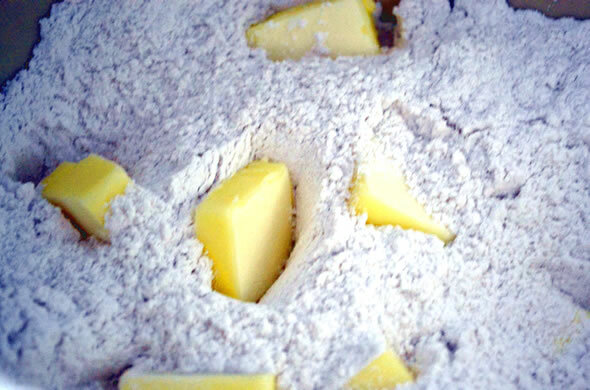 Bake 30-40 minutes and let stand at least 5 minutes before cutting. This is an oozer! I waited and cut but it still oozed a bit. I mean, the inside is very malleable so it started escaping a bit. I can’t even imagine if I cut it immediately! Be sure to fill, fill, and fill the calzone some more. 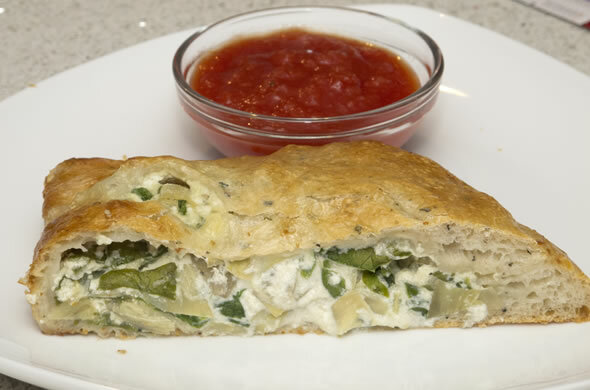 The worst homemade calzones are super doughy without much in the middle. Get that filling all the way to the edges too. The eggwash is optional. It’ll make the top shiny and restaurant-quality looking. I also never recommend trying to transport the uncooked calzone. Load it up right on the pan you’re cooking it on. You’ll hate your life trying to move it since you won’t have enough hands/spatulas/coordination to move it from your counter to the pan gracefully. The flavors were good, and the crust was the crunch needed but I thought the inside was too much of the same texture. 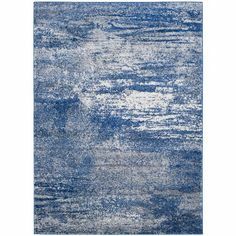 I think because I had a texture issue with this, I’d stick to spinach and artichoke as dip or maybe I’d do it as pizza. Check out my other calzones I’d recommend in a heartbeat. I have lots of sleep to get caught up, a mound of laundry, a husband, family, friends and pup who may have felt neglected by me, and probably multiple emails to catch up on but I’ve been formulating a list of what I want to accomplish after my event is over this season. I work all year for an event this past weekend. It is crazy but as we say in the biz, we chose this life. The thousands of people who participated last weekend raised millions of dollars and changed the lives of medically uninsured or underinsured, in addition to their own. My head is spinning. Stay tuned, and tell me, what should I make? I love leftovers. I love transforming one thing into something totally different annnnnd I love not spending any money to do it. These were a prime example of all these things. I had leftover risotto from the other day. I made more than usual but even with Mr. J and I eating it with dinner one night and leftovers for lunch the next day, there was still a good amount. 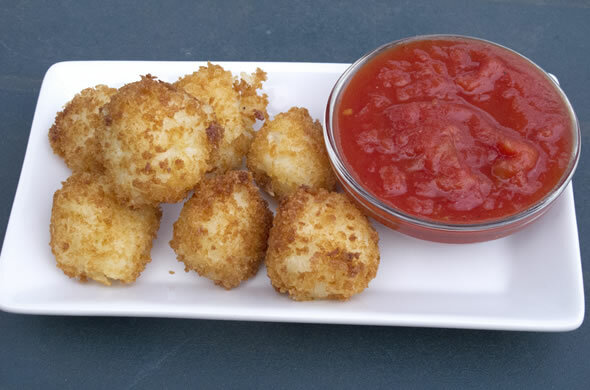 I decided to make aranchini! Aranchini are historically Sicilian but as you can imagine other regions of Italy have similar ones that they’ll tell you are not aranchini. I learned this while dining with the mob. Mine are not authentic since I didn’t have any mozzarella for the middle. Even without this seemingly key ingredient, these were simply delicious. Maybe because I fried them. I never fry anything so it makes me appreciate it even more. Frying makes me anxious and it’s such a mess. Fry in batches turning until golden brown. Remove and let rest on paper towel. These were so surprisingly good! I let them get pretty fried before turning them the first time. I think that really helped them stay together since they had a solid fried base on the bottom when I scooped with a slotted spoon. We each ate a few as an app with dinner and I froze the rest. I think they’ll defrost pretty easily in the fridge and bake to reheat. They’ll be awesome when this weekend is over and I can celebrate a successful event (knock on wood!). I work all year for this weekend so wish me luck, dry weather, well behaved vendors, and lots of fundraising $$ coming in! I posted some coconut chicken the other day and called that part 1. Today is part 2. 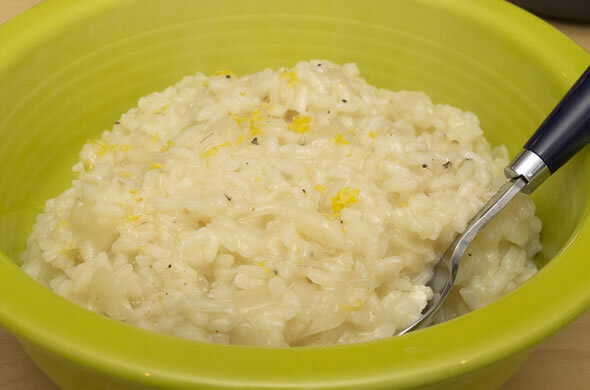 The side dish: lemon risotto. Put on your seatbelts because later this week is the leftovers transformed into a real treat. I’m not kidding. I make risotto quite frequently. Like here. And here. And here. I think of risotto as a wintery comfort food that gets a bad rap for being difficult. I always think that lemon asparagus risotto sounds delicious but I never think of it when spring rolls around. Well here we go! Carpe diem! I decided on just lemon risotto since I wasn’t feeling having too many parts of the meal all together. Sautee the onion and a bit of olive oil in a pot. Add the rice into the onions once they’re 75% cooked (translucent but still before they’re totally soft). 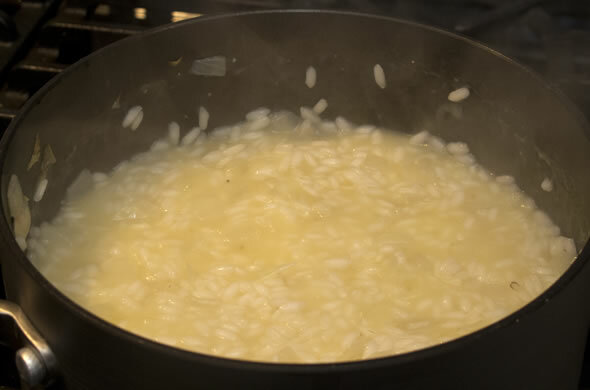 Add one cup of liquid into the rice and stir until absorbed before adding the next cup into the rice. Repeat until all the liquid is absorbed, little by little. It will take about 30 minutes on medium heat. Add lemon zest on top once it is totally cooked. See? So easy. It takes time and you have to stay nearby, but if you’re putting together other dinner items you’ll have plenty of time. I love risotto and don’t always like regular rice that much. Risotto is creamier, and not as dry. Wait till you see what I did with the leftovers!! Here’s an easy one that will actually be part 1 of 3. I’m crazy right now at work which has spiraled into the rest of my life. I’ve been saying that for awhile but the end is near. Think of all you stress at work, and condense that to 3 months. I’m not at all stressed 9 months of the year, then the insanity ensues. It is worth it…I think. People ask all the time where I get inspiration. Everywhere! This time it was partially from pinterest when I saw some coconut shrimp. I ended up making them around Christmas. 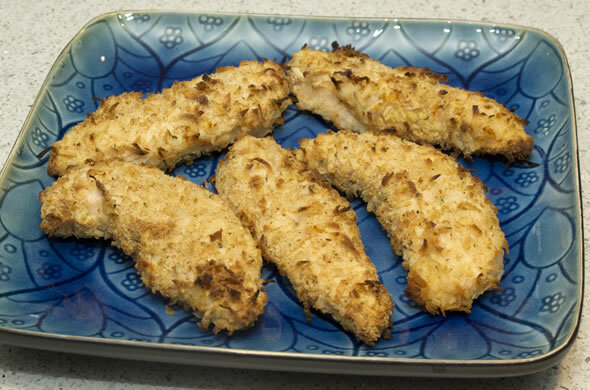 The coconut chicken idea was also from the appetizers at my wedding. 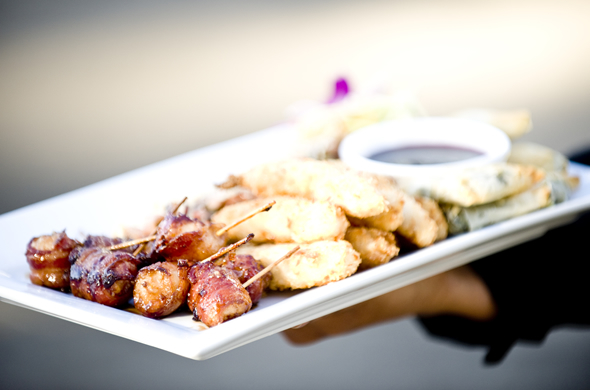 I wish I had remembered that the coconut chicken at the wedding came with this really silky raspberry dipping sauce. Ohh well, next time! This was such an easy one to whip up. I had plans for the rest of the chicken but again, like I’m obsessed with, you could make a ton and freeze it. I baked these so they would be healthier and not as messy. 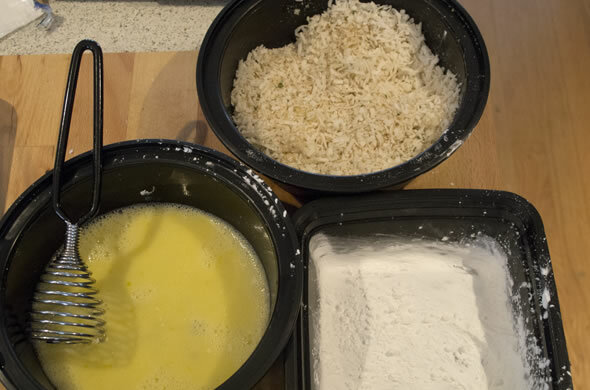 Set up your trio of dredges: 1st cornstarch, 2nd eggwash, 3rd breadcrumbs & coconut mixed. 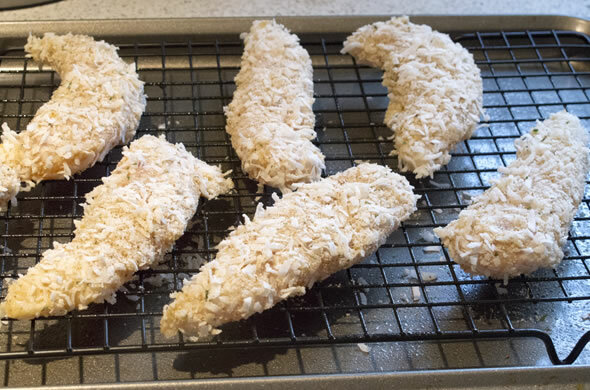 Dredge each chicken strip and put onto a cookie sheet with a cooling rack on top of it. Bake at 375 degrees for 20 minutes, flipping once. I loved the coconut flavor. It had a great crunch without being greasy. 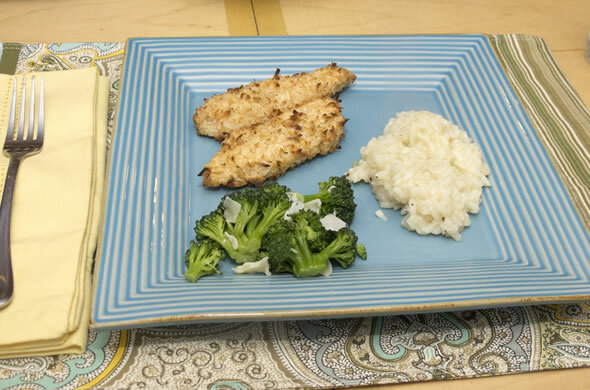 I served these coconut chicken strips with lemon risotto which felt super summery and some steamed broccoli. Stay tuned for part 2: the risotto and part 3: leftovers turned into a treat! My Grandma W wasn’t known for her cooking but I’ve thought of her often lately. She would have loved Mr. J and she would be really proud that we got the house. 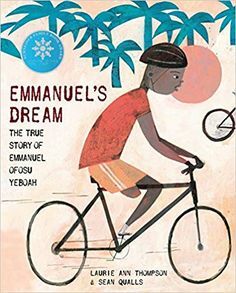 She was a tough cookie but her grandchildren could do no wrong. She made fantastic fudge, chex-mix, and baked ziti. Mine didn’t quite rival hers, but it was good. 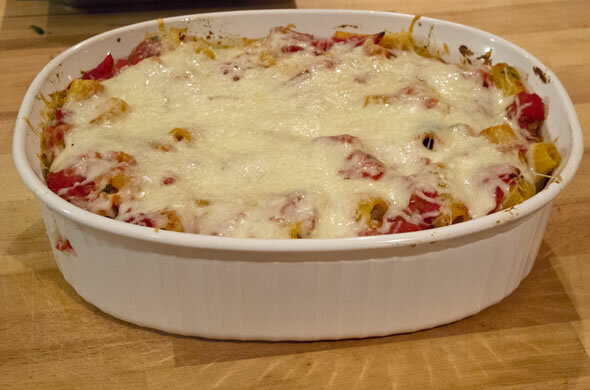 The perfect sauce with lots of cheese was an ideal dinner. I concentrated on making sure there was a ton of cheese and that the noodles were cooked perfectly. 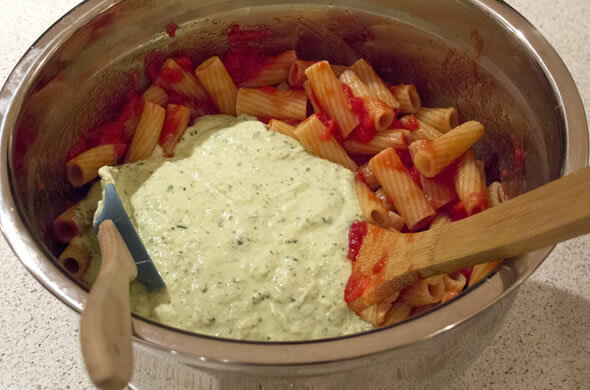 Mix ricotta with pasta, half the sauce, and half the mozzarella. 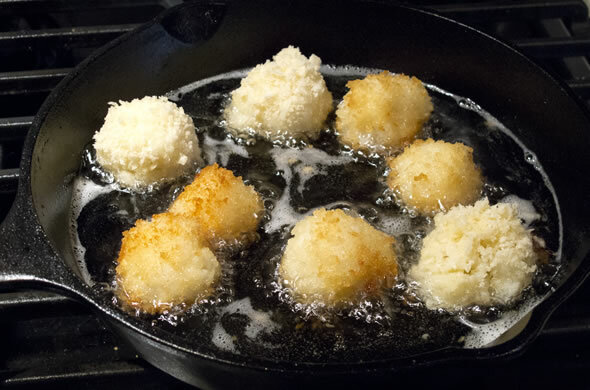 Spread into a greased pan and top with remaining sauce. Bake 30 minutes covered. Then top with remaining cheese and bake until melted. If I were making this Grandma W style, I would have added meatballs, chicken thighs, sausage, pepperoni, peppers, and onions. Mine was simplier but I liked it a lot. I have a strong love for ricotta. 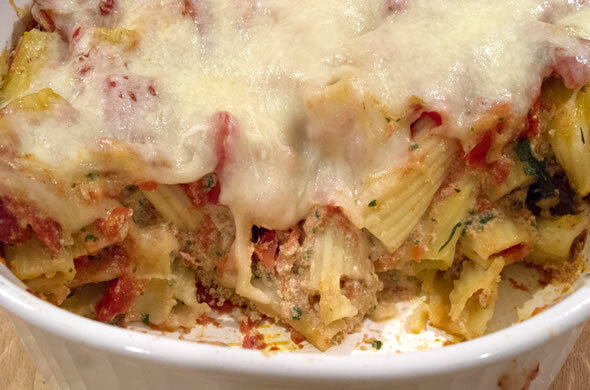 It reminded me of a baked pasta Ms. L made for me. I liked the crispy ones at the edges. 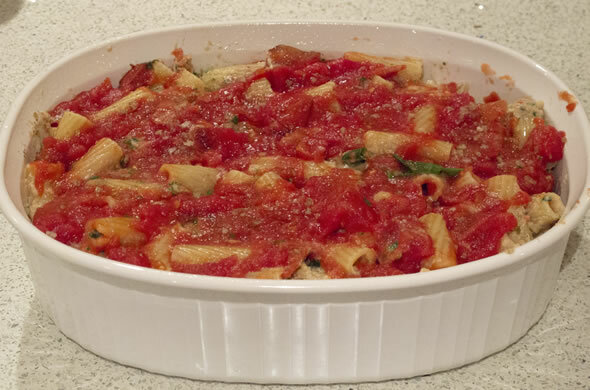 I think this dish is super easy, can be made ahead of time, and is definitely a cheap dinner. This is a suuuuuper crazy time of year for me. Think laughing/crying/exhaustion with a never-ending to-do list. I love my job…it just that I have the whole year’s worth of stress compacted into only a few months. I love that folks wanted to help me with guest posts. Today I have Amy of Wicked Good Travel. You’ve met Amy before, here, and she was here, and I was on her blog here. Baking and I are not friends. I was always more than happy to reap the benefits of baking that others did, but I wanted no part of hangin’ out with baking on my own. Cooking and I are serious BFFs though. We get along like a house on fire…is that a bad metaphor for cooking? Anyway, whenever baking and I got together it ended in tears, shouting, and hopping up and down in anger. This came along with a huge mess that looked like I’d murdered a platter of cupcakes and then tried to cover up my sins with a bag of flour. Seriously. It never went well. But lately as I’ve gotten increasingly better and more confident at cooking I felt like I needed a challenge. It started with homemade pasta. The first batch of pasta dough failed miserably, but then I watched a video and tried again and it worked! Then recently I wanted to make biscuits and gravy, but I didn’t have any pre-made biscuits I could pop in the oven, and I thought ‘well, if I’m really a food blogger, then I should be up for the challenge of making stuff from scratch as much as possible.’ So, I decided to try my hand at homemade biscuits. It all was going so well, until I failed to read the ingredients that said “self-rising flour” and used “all-purpose flour” instead, without adding any baking powder or baking soda. You might think at that point I would throw in the towel. But, that simple mistake suddenly flipped the switch in my brain, and seeing what happened to the biscuits minus that ingredient made it easier to understand why I needed to follow baking instructions more carefully. I know, it all sounds so obvious. And honestly, I did always know why following measurements and not swapping out ingredients on a whim while baking was important. But alas, I’m a creative, passionate type and I didn’t want to deal with that rigidity as I saw it. I wanted to be free to throw this in and add a pinch of that, or totally mix it up or sideways and get downright crazy! Since I couldn’t do that with baking, despite my valiant efforts, I shunned the activity. Yet, with this recent hiccup regarding the biscuits I found myself getting right back on the horse and the following weekend I made them again. And they came out perfectly. Suddenly, I had found that freedom I always thought was nonexistent with baking. I also found that yes, I could bake. I just had to pay attention as a beginner. Now, I was free to rule the world of baking should I wish! So, with that in mind, I decided to get seriously crazy. 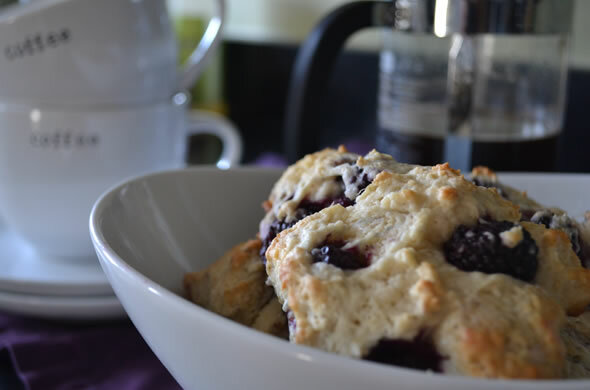 I decided… to make scones. 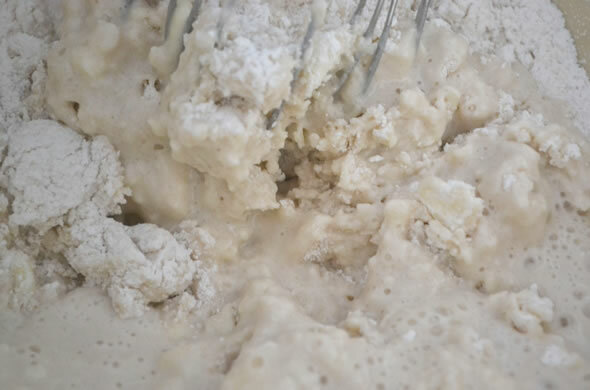 Combine milk and vanilla extract and pout into flour mixture. Stir until dough comes together. 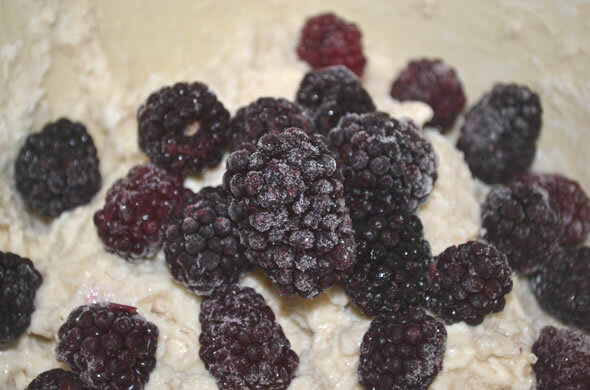 Add blackberries and gently knead into the dough. It is ok if some berries get slightly squished. 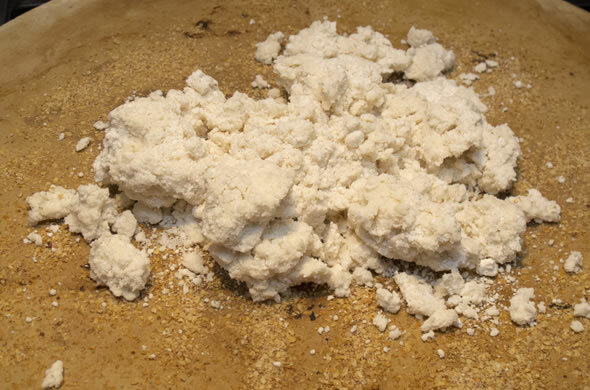 Turn dough out onto a lightly floured surface, and flatten dough into a disc about 3/4-inch thick. Use a knife to divide disc into six triangles. Place scones on prepared baking sheet. Sprinkle generously with coarse sugar. Bake for 20 minutes, until scones are golden brown. Again, everything seemed to be going so well, so I snapped photos away ready to blog my triumph. But as the dough came together and I had to roll it out, all seemed lost. 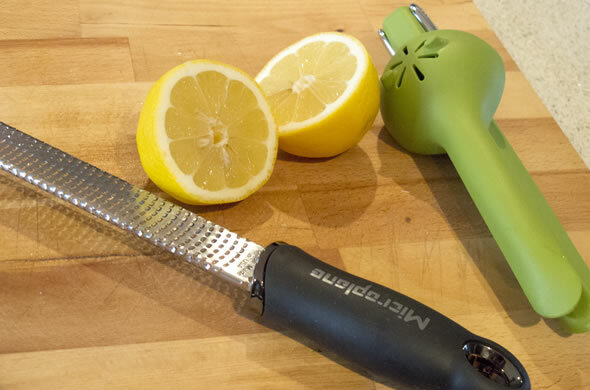 It was so sticky and seemed too wet – I couldn’t cut the dough as perfectly as I had expected so I cut rough triangles and gingerly put them on the baking sheet. Hence the lack of photos of the dough. Imagine my surprise when I pulled them out of the oven as the timer bell went off, and cut a piece off with some serious trepidation, and I realized I had made a bonafide scone. They tasted so amazing!! I couldn’t believe it. I’ve already started my next baking venture- I’m going to make oatcakes. The batter is sitting on my kitchen counter as I type, patiently waiting to be rolled out tomorrow, per instructions. 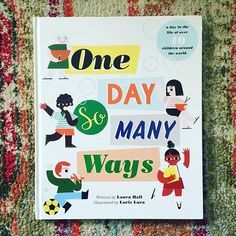 Well, thanks so much to Emily for allowing me a little space on her corner of the Interweb to share my success with you all! 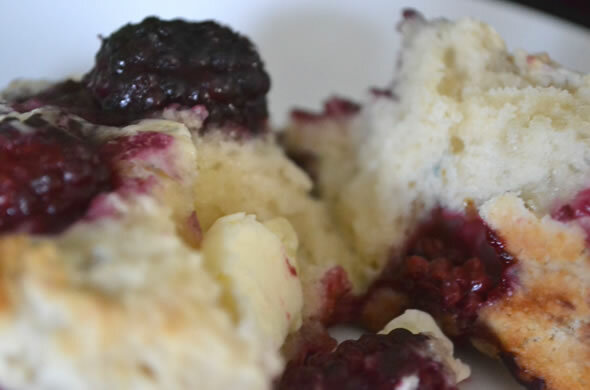 I encourage you to give the recipe for Blackberry Scones a go, which can easily become Raspberry Scones, or Blueberry Scones, or Walnut Scones…all I know is we’re gonna be bakin’ away in this house going forward. And I have learned that there’s enough room in my heart and my skills to be BFFs with both cooking and baking. Interested in being a guest blogger? Email emily@thethreebiterule.com for more details!